I’ve been meaning to make leeks with vinaigrette since we got back from Paris at the beginning of March. We were primed for a fancy lunch for my great Aunty Suzy’s 100th birthday, but selfishly, she got ill and was in hospital on the day. So instead, we all ended up going to a brasserie next to the hospital in the south west of the city. 30 of us. Just outside of the périphérique. Can you imagine sinking so low? We visited her after. We piled straight in at the height of lunchtime, all seated without so much as a Gallic shrug. And while we were split into two tables, we still managed to eat at the same time. The very nice man looking after our table only forgot to bring my citron pressé. Three times. And then he told me they didn’t have any more lemons and “how about orange?” I still haven’t let go of my disappointment. I can’t. I was really looking forward to it. I haven’t got a clue what anyone else ate. I dimly remember my main course as something to do with cod. It was a busy place, lively, fun and full of Parisians being Parisian. Doing French stuff like reading poetry and having affairs, all in their lunch break. But it was my starter which I loved and which reminded me of how simple food is often the best. 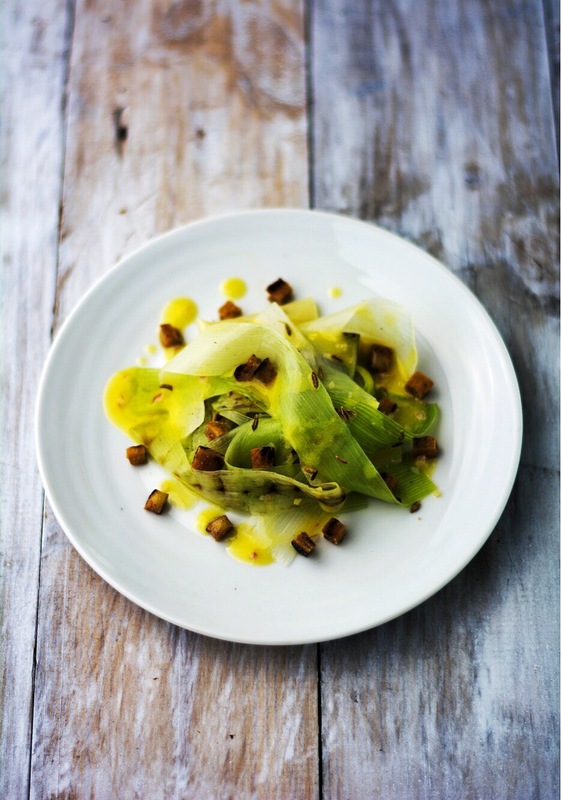 And you can’t get much simpler than some leek, cooked until soft and dressed in vinaigrette. Theirs had a touch of cream in it, softening it gently and making it silky smooth. Mine has some finely minced shallot in and I’ve sprinkled some croutons on top to give a little crunch. Make sure you use fresh and tender leek. Steam them if possible, this dish can end up a little ‘leathery’ and chewy if you’re not careful. Served gently warm or slightly cold, this is an elegant starter with friends for supper or even a light lunch. You can prepare it ahead of time too, one job fewer if you’re entertaining. Steam the sliced leek for about four minutes then drain and run under cold water to stop the cooking. While the leek is cooking, heat a sauté pan with some olive oil and cut the bread into small cubes. Toast them in the oil until nice and crisp then drain on kitchen paper and toss through with the garam masala and fennel seeds. Make the vinaigrette by mixing the vinegar with the mustard and a pinch of salt, then slowly whisk in the oils to make an emulsion. Loosen it a little with a splash or two of water and mix in the shallot. Toss the leek through with the vinaigrette and divide between four plates, scattering over the croutons and a few more fennel seeds if you like. Finish with another pinch of salt on the leeks.